Canal front with open bay views. Main home has 3 Br. and 2 Ba. with living room, dining area and nice kitchen. Large Florida room overlooking the canal (with boat dock). Attached to the home is a mother-in-law suite with its own entrance. Included there is a large main bedroom with a full bath, living area and a kitchenette. Great open deck from bedroom on the second level has great views of the open bay. Boat dock out back for the water toys. Being sold fully furnished and ready to go. One car attached garage too. Beautiful brand new construction in the quaint community of Waters Run -just a few miles from the beach in Fenwick. This brand new home offers an iiting, open living space overlooking Dirickson Creek. Enjoy a first floor master bedroom with views as well as a large screen porch overlooking the water. Gorgeous fireplace with stone finishes, custom cabinetry and top-of-the-line kitchen and baths. Upstairs you can enjoy an extra living space as well as three additional bedrooms. This community offers a pool playground tennis and water access. Enjoy the natural wildlife out your back door. This is a must see! The always popular Calloway floorplan with spacious first floor living for you, and 3 more bedrooms (2 ensuite) for your guests/family. Backing up to protected wetlands and woods for privacy and shade, this professionally landscaped home has much to offer. Hardwood floors in the Great Room/Dining Rm/Kitchen/Breakfast area and Den. The dine-in Kitchen has Stainless Steel appliances, & a long Breakfast bar for plenty of extra seating. 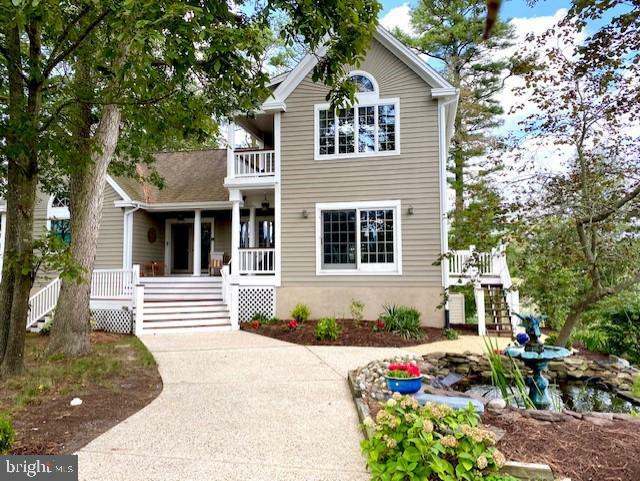 Enjoy watching the wild life in the Sunroom which overlooks the wooded backyard and Deck. The bright Great Room has a vaulted ceiling, and built in Bookcases surround the Gas Fireplace and TV cabinet. A first floor Master Suite with a large walk in closet, 2 vanity sinks, soaking tub, and extra large walk in shower makes for the best in one floor living. Plus, enjoy time outdoors on the large front porch, or the back deck, or at one of the many amenities at The Refuge. Be close to shopping, the Freeman Stage, & more. There is also a community boat ramp! Unique Property! You will not find anything else like this Property elsewhere. Priced Below Appraised Value! No Selbyville city tax, NO HOA Fees. This private beach retreat is nestled on just over two-acres of land just off of Rt. 54. The home is centrally located and just a few short miles from the MD and DE beaches. Enjoy an abundance of beautiful landscaping, your own private indoor Heated Spa/ Exercise Pool, a detached 2 Car garage suitable for a workshop (100 amp service) and a large pole barn/carport (for all your toys). This Expansive home has 4 bedrooms,2.5baths, eat-in Kitchen with gas Fireplace, Family room with gas Free standing stove, Formal Dining room and Den. The seperate Master Suitewith Walki-in shower, has a Walk-in Closet, and it's own screened inporch with ceiling fan and Cable tv connection. Property has a small Wooden Bridge to reach its adjoining back lot. This is a Must See Property for anyone who wants to live near the beach but have no reason to leave home! Most importantly, this home has Selbyville city water (also a Private Well), but there are no Selbyville city taxes or Town Restrictions! This expansive home has 4 Bedrooms, 2.5 baths and a large family room with a gas freestanding stove, eat-in kitchen with gas fireplace, separate master suite with walk-in shower and its own screened porch. Wait, there's more! The indoor pool has gas heater, jacuzzi jets and a swim jet for exercise. Property also has a small bridge to reach its adjoining back lot. This is a must see property for anyone who wants to live near the beach but have no reason to leave home. Schedule your showing today. Agents can access Documents like a Current Appraisal (Home is priced below), Survey, Home Inspection (any items pointed out have been repaired), Solar Contract, and information to contact Solar Company for more information on how contract works and procedure for transfer. So Contact the Listing agent or your own agent for more information today.